Well, well, well. It's just over three weeks since England succumbed grimly to defeat in Ahmedabad in the first Test match of this series. There was an abundance of wailing and tears about our boy's inability to play spin (yes, some of those complaints were mine). At the same time the Indian media and fans weren't backwards in coming forward with loud declarations of the "revenge series". How things are different now eh? Captain square jaw the magnificent and his band of brothers stand on the brink of a series win for the first time since Adam was a lad. Our plucky boys can play spin. Oh, and the Indian media are now calling for heads to roll with even 'untouchables' like the great Sachin now being mooted for retirement. So time for us to play it cautious-like then? Well, no. The team management pull off a election coup that catches everyone by surprise by dropping Samit Patel (ok, well maybe that part isn't too much of a surprise) and replacing him with 21 year old Yorkshireman Joe Root. Personally, it's not on the basis of his talent that I'm surprised , his first class average of 38.01 is good as the clip below indicates the precocious fielding talent that the boy has. Nor is it the fact that he looks about 10, OK, maybe nearer 11. However, throwing him into a Test match debut that will determine our first series win in India since 1985 could be construed as something of a gamble. On the other hand Messrs Flowers and co rarely do something like this unless they have complete faith in the player involved, as a certain Mr Cook would testify. On inspection it seems that the prepared pitch has as much life in it as something that has absolutely no life in it. Nobody is quite sure what the Indians are playing at, but it could be part of some cunning master plan as they include just one seam bowler and 3 spinners. Everybody, and I mean everybody, is saying that this is possibly the most lifeless and sub-standard pitch for many years and that barring any major calamity once you get in, you're in…..something dastardly is afoot. The Indians may indeed bore the England batsmen to death, but its also another potential nail in the coffin of Test cricket. So begins what turns out to be a day in what the commentators keep calling 'for the purists' - in other words, periods when the play is bloody boring. It was indeed a day of attritional batting, time will tell if the England batsmen were making heavy weather of it all. Wickets fell cheaply early on with a mixture of good seam bowling from Sharma (boy, this guy can bowl), a number of inept umpiring decisions and a couple of players practically giving away their wicket (yes I'm talking about you Mr Petersen). Captain Cook's Lbw decision was clearly a mistake, with Geoffrey Boycott on TMS particularly incredulous - "That's a shocking decision. If he can't see that from 22 yards, that's a shocker. I can see it from 170 yards away." cried our Geoffrey. On a number of occasions, Trott and Pietersen, brought up on fast and lively South African pitches, attempted to pull a short ball before playing defensively on the crouch as the ball ambled towards them after contacting this lifeless pitch. Their third-wicket stand of 86 with Pietersen provided England's only concerted response, but after Trott made an error of judgement, Ian Bell's unimpressive record on the sub-continent continued as he prodded a half-volley to short extra cover. Not the most exciting of days play. CLOSE OF PLAY- England are on 199-5, a below par score in the modern day game, but probably representative of the state of the pitch. There were a couple of moments in the early overs when I thought England could collapse this morning, but oh me of little faith as they battled hard in this continuing war of attrition. Particular mention needs to be made of three fabulous innings from Prior (an excellent 57), Root ( a patient 73) and Swann (smashing 56 quick runs) - Root was just like a 'Yorkshire Wall' in the mold of Rahul Dravid - not like me to get carried away eh? Regardless, Joe Root's time at the crease was the longest debut innings for an England player since Roger Tolchard against India at Eden Gardens in 1976-77. England reach 330 all out - is it enough? Well, read on below….. The benign pitch had offered little seam, swing or spin for the Indian bowling attack, but as soon as Golden god Anderson got the new ball in his hand he immediately had India in trouble.The pace man bowled both Virender Sehwag (0) and Sachin Tendulkar (2) and had Gautam Gambhir (37) caught behind. Poor old Sachin, what the heck is going on? It seems that every other week at the moment that one of the modern greats realises that father time has finally caught up with them Last week Punter decided that enough is enough and that going down as the only Aussie captain to lose an Ashes series home and away was a fitting epitaph for a fine career. My guess is that Sachin is next on the list, if he fails in the 2nd innings that could well be it for the little master. The entertainment wasn't yet finished as we witnessed in the last over of the day Jonathan Trott having a trundle with his right-arm military medium. The panic in the eyes of the Indian batsmen knowing that every one of the millions in India know he's the sort of bowler that getting out to is tantamount to chucking ones cricket career away. As it turns out, nothing happens of note as the Indian pair walk off, still trailing by 243 runs…….surely we are in the driving seat now? Jimmy and his ongoing impression of being a Golden god. SPOILER ALERT - THE WORD 'ATTRITIONAL' MAY ONCE AGAIN BE USED IN THE ACCOUNT OF THE DAYS PLAY. Which buffoon got at at stupid o'clock to watch perhaps the most uneventful day of Test cricket ever, then decided to leave the tv coverage to take the dog for a walk and subsequently missed the clatter of wickets at the end of the day's play? The days play once again tested the patience of even the most hardened cricket watcher, bringing back memories of watch Chris Tavere opening the batting…..yes it was that bad. The day progressed with me feeling less than excited at the attritional rate of runs being scored. However, that feeling was quickly being usurped by a sense of unease as Dhoni and Kohli developed a partnership what was taking the Indian total ever nearer the English first innings score. Even when Kohli was eventually out lbw to spin twin Swann for a magnificent 103 and then shortly after Jadeja given a seeing to by golden god Jimmy Anderson it still left India just 30 odd runs shy of Englands score. Nerves were starting to jingle jangle. What was needed at this moment was a hero, a man of steel, a square jawed leader of men…… step forward Alistair Cook, you beauty…. Wow, just wow. That was reminiscent of Freddie Flintoff''s run out of Punter in the 2009 Ashes game at the Oval in it's importance - this moment could be as important in turning the tide of the match after it seemed certain that Dhoni but would both reach his 100 and steer his side well past England's total. Five hours without a wicket (which I watched mostly every ball), then four wickets in an hour (which I missed, every bloody ball)…..
India eventually finish the day 33 runs behind England on 297-8. Talk about the match being delicately poised. Both Dhoni and Kohli rather annoyingly played the situation precisely right and they have provided their side with a chance in this match that didn't seem available at the end of yesterday's play. The pressure is now back on England to make it safe……oh goody, more stress. Blimey, maybe he is indeed a golden god. A days cricket that frankly had it all - Some strange decisions regarding a declaration from the Indian captain, some good pressurising bowling, the occasional stroke play from under pressure batsmen and to top it all there was a bit of argy-bargy out there in that final session after a dead ball smash from Trott. The opening overs of the game were quite frankly rather bizarre from both teams. England seemed quite content to set a defensive field almost as though that Don Bradman was at the crease. Yes maybe they were trying to take time out of the game, but all it seemed to do was betray England's fears that they actually didn't want to bat. Even when Ojha was bowled by spin twin Monty our boys didn't seem that happy, in fact they looked positively annoyed that they were one batsman nearer to having to bat themselves. Bizarre. Not a good signal to be sending to the Indian team. Dhoni, on the other hand seemed to think that there was a prize for simply getting as close to the England score as possible, not realising that lost time just prodding around for a few runs here and there was probably harming them more than us. Finally sanity prevails and the Indians declare on 320-9, just 4 runs behind. 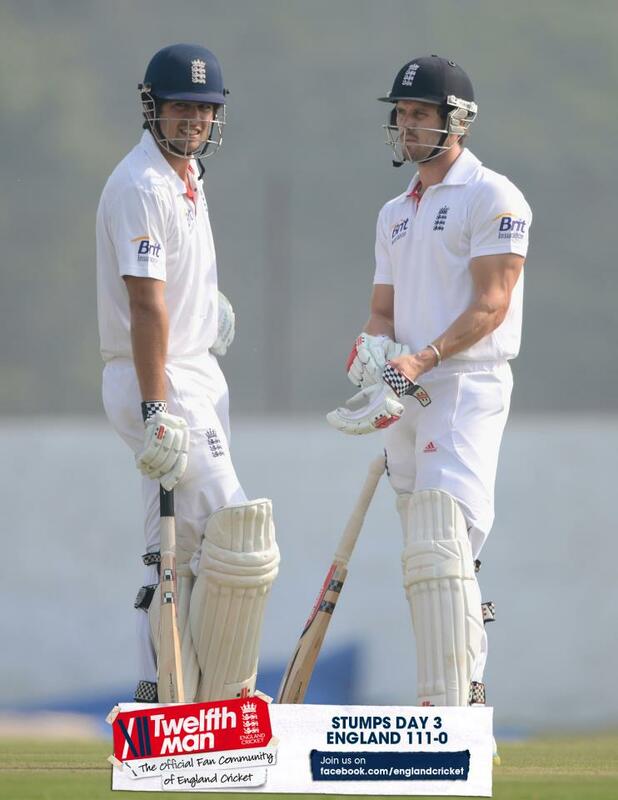 This means that in order to make the game ram-rod safe, England will need to bat for over 4 sessions……. if anyone mentions the word 'collapse' I will hunt them down….. If the proceedings earlier in the day needed some form of explanation then the period of play up to lunch was pretty self explanatory - England knew that sessions and sessions lay ahead so the go-slow was on…..in style. At one point Cook scored just 1 run in 46 balls. Things slightly improve after lunch when in one particular over Cook goes boom boom crazy and scores two runs in succession and gives the scorers a real fright when they are suddenly waken from their nap. The attrition (sorry) continues, only relived by another contentious ( i.e wrong) decision to give our magnificent captain out. Cook clearly didn't nick the ball, wrong again umpire Dharmasena - worlds number 1 umpire? I don't think so. And so we come to the bizarre highlight of the day. The atmosphere frankly from that point goes downwards pretty quickly with the combination of England making slow but sure progress and Trott (yes him again) being 'challenged' on more than one occasion by the odd rude Indian fielder (yes I'm talking about you Mr Kohli). Trott being giving not out after probably nicking the ball only goes to make things more tetchy. Would me emailing the Indian cricket board and mentioning that DRS wold have clearly benefited them help at all?…methinks not. 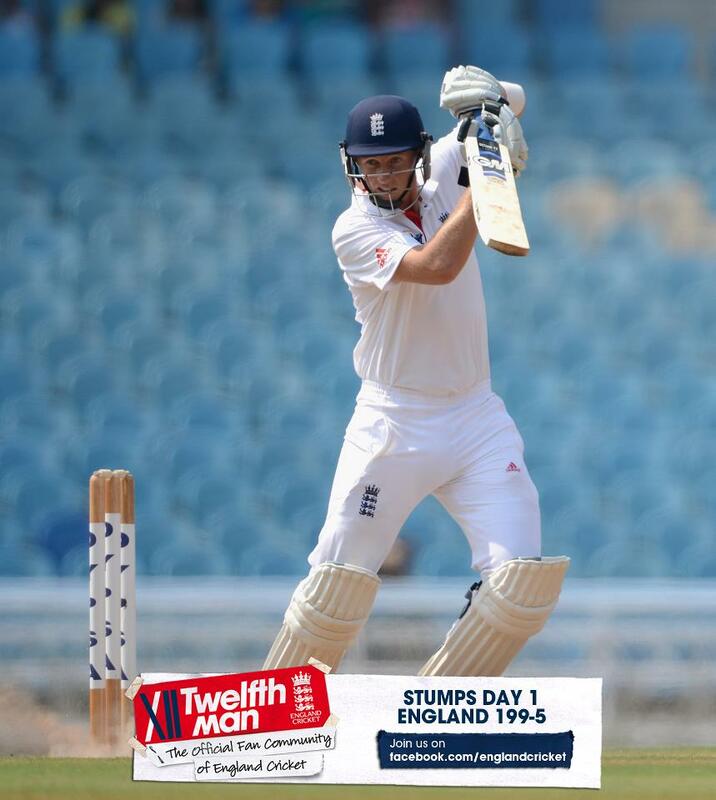 England finish the day on 161 for 3 and lead by 165 with one day of the Test series remaining. That's it for another day - just one day of a memorable Test series to go, and all four results are still possible in this topsy-turvy game. In the end it was all rather ( and this is not a word that is often said as and England fan) easy. The pitch continued on it's docile way and contributed little in the way of either helping the bowlers and enabling fluent stroke play. To be fair, Trott and Bell played magnificently with the former eventually out for an excellent 143. Bell too made his century ending the day unbeaten on 166, England eventually reaching 352-4 and thus drawing the match. Golden God Jimmy Anderson was rightly named man of the match. I think it may be about time that I started lying and saying that actually he is related to me. So, for the first time since the 1984-85 series the England boys win a series in India (2-1). What is even more impressive is the fact that this happened after Cook and the boys got their arses well and truly slapped in the nine-wicket thrashing in the opening Test and releasing immediate boasts from some Indian quarters of a 4-0 whitewash. Were the Indians complacent? Well possibly so. Were some of their world class players not on their best form? Yes, absolutely. However, what cannot be denied it that after the disaster of that first Test lessons were learnt on and off the pitch. Monty was given his rightful place back in the side which meant that together with fellow spin twin Swann we had better spinners than the Indians. KP ( and it seems the rest of the team) put the texting nonsense behind him and went back to producing at least one world class stunner of an innings per series. Cook's runs and captaincy reached new and heart stopping heights and the potential for the lad to go on and smash every cricketing record in the books is simply huge. So the future is bright. Captain fantastic is becoming ever more, well, fantastic. Many of our players returned to form and and others further cemented their qualities. What is also exciting is the number of young players, such as Root, Compton and Bairstow legitimately vying for places. Lets not complacent and carried away though eh? There have been a few false dawns before. Nah, bugger that. BRING ON THE AUSSIES!!!!!! We really need to check this coin that they're using as yet again we lose the toss for the third time in row and India choose to bat. When it comes to Test cricket, the age-old mentality of Indian players has been to view pastimes like fielding as no more than a pesky irritation that has to be experienced for a while until they go into bat. So once again, Dhoni, the Indian captain, could barely conceal his joy as once again stated that his side would bat first. I could barely conceal my depression at getting up at 3am to watch an opposing team swagger on a flat pitch again. Our victory by 10 wickets in the previous Test was inspired by the spin twins, Monty Panesar and Graeme Swann, who took all but one of the 20 wickets between them. So this time the Indians were going to be prepared…..or so they thought. Quite simply, our pace bowlers were outstanding with Jimmy Anderson ( no relation) leading the way, finding swing with the old and second new balls on a benign pitch. Meanwhile, Finn, unlucky not take a wicket on his recall, bowled with pace and hostility to look intimidating. The initial proceedings were given a bizarre boost with the dismissal first of Sehwag by his partner Gambhir, who seems to have been reading Nasser Hussein's text book '101 ways to run out your partner' ( with a foreword by Geoffrey Boycott). Sehwag dabbed the ball to deep midwicket and wanted three runs. Gambhir had no interest whatsoever in a third run and was staring at the magnificent fielding by Finny and oblivious to Sehwag charging towards him. Sehwag tried turning around with the balletic grace of someone without any balletic grace . The throw from Finn was fired in like a tracer bullet and Prior had enough time to pop back to the changing rooms for a quick shower and change of kit before whipping off the bails. At the end of the first day Captain fantastic Cook and his band of brothers were outstanding in reducing India to 273-7. I have a good feeling about this. During the night my good feeling decided to do a runner on me, so when the alarm went off at stupid o'clock for the start of play I fully expected the benign pitch to thwart our bowlers for a couple of hours so I decided to ignore the alarm. Oh me of little faith - England actually made relatively light work of getting rid of the India tail as Monty had Zaheer Khan trapped lbw for six and then rearranged Ishant Sharma's stumps in a nice symmetrical pattern of chaos. So by the time I had wandered in my semi-comatose state downstairs to the TV, the heroic Cook and Compton were already making steady progress and annoying the Indian bowlers by being rather good again at playing spin. As play progresses the Indian fielders decide that their fielding would actually be much suitable if accompanied by the theme from the Benny Hill show as Cook is dropped on 17. There are also a plethora of other Keystone cops moments in the field keep us all amused. I was hoping to include some pictorial evidence of the various comedic moments, however the row between the Indian board of cricket and the international press (yes, another one) means that there a few independent photographs of the action). Things grow ever more surreal as the days play goes on with the magnificent Cook setting a record for England Test centuries with his 23rd heeling us gain control of the match. Doing so passed the total of 22 held by Wally Hammond, Colin Cowdrey, Geoffrey Boycott and Kevin Pietersen. Geoffrey is currently at the Test match commentating for TMS…….he didn't look pleased. 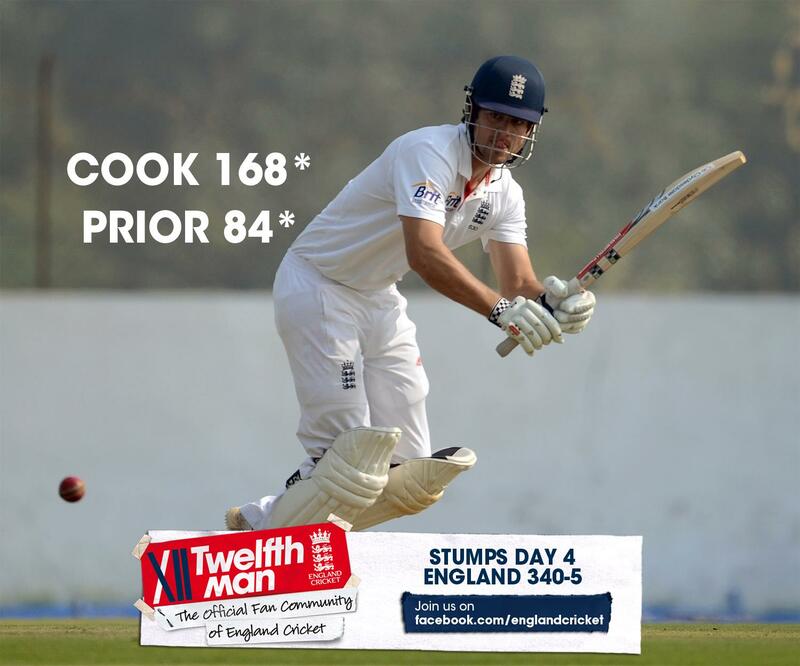 Cook made 136 not out as England reached 216-1 in reply to India's 316 all out at the close of the day at Eden Gardens. Captain Cook apparently isn't satisfied with breaking cricketing records on what seems like a daily basis; The youngest ever batsmen to reach 7000 runs, highest ever amount of Test centuries for an England batsman and the winner of 'The square jawed hero of our time' competition, to name but three, well two. No, not only that, but unbeknown to all he had secretly put his name forward for 'The most unusual dismissal of the millennium' award today , and what a magnificent entry it is. 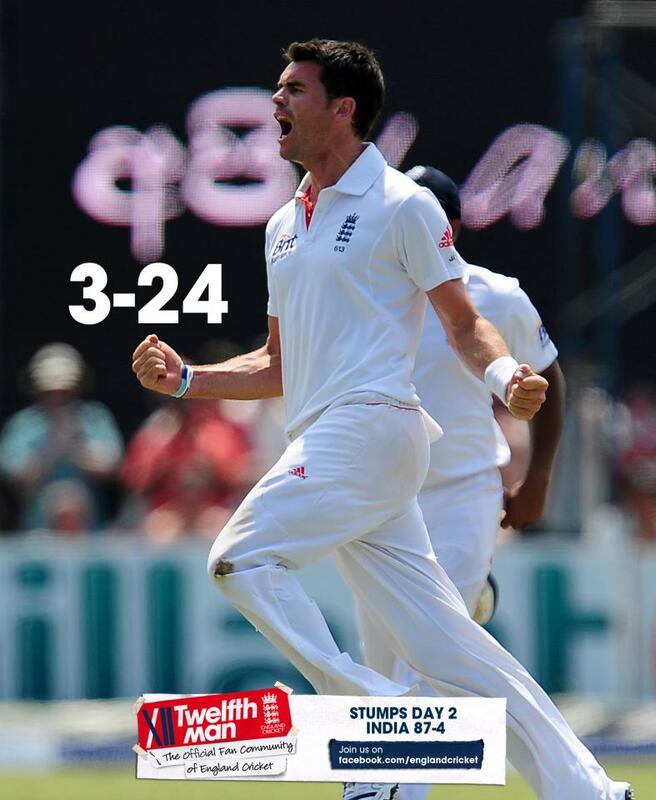 Picture the scene……England are coasting on 359-2 when KP smacked the ball into the covers and declined to run. Cook was taking evasive action to avoid Kohli's throw but was out of his ground as the ball struck his wicket. According to the laws of the game, If Cook had grounded his bat before the throw, then ducked to avoid the ball, the umpire would have given him not out. As it was, Captain fantastic just stopped short of dropping his bat over the crease before allowing the ball to pass by and, by the time the stumps were hit, it was too late. Our Square-jawed hero knew straight away that it was bye-bye double century, putting his head in his hands as the umpires debated the decision. Thus Captain Cook broke yet another record - Mr John Rabone (Dubai based architect, drumming legend and sadly, Man Utd supporter) informs me that this was the first time that Cook had ever been run out in 1st class cricket making it something of a world record. So another major innings from Cook, excellent return to form from Trott, Bell looked as rusty as someone who had been given leave to fly a round trip of oodles of miles to attend the birth of his new son and Patel was unlucky again. The evening session saw Matt Prior and Graeme Swann adding an unbroken stand of 56, England closed on 509-6, providing a lead of 193. England are completely on top now in this Test match and barring a disaster of Abu Dhabi proportions (Oh god, the flashbacks!) there is very little chance of us losing this game. But can we win it and take a 2-1 lead in the series? P.S. As I write this entry at the end of the days play the TV coverage is still on. There are curious goings on out in the middle as the Indian warm-down apparently comprises of players lying prostrate on their front while the Indian physio walks up and down on their backsides……. well we all need a hobby I guess. I had set the alarm for 3am. Realised that play had a while to start. Fell asleep. Woke up in time to see that we had lost our first wicket in the very first over. Went to make a cup of coffee, came back and another 2 wickets had fallen. The final wicket falls before I can finish it. England are all out 523, a lead of 207. Anyhow, the home side reach lunch with something of a regained swagger with the crowd as excitable as ever when the home team decide to have a go, the score is 86-0 at Lunch. My natural unswerving optimism is starting to deplete. In fact it could be more accurately described as the possible onset of squeaky bum time as thoughts of Sehwag and Tendulker deciding that the time is right to give us another spanking. Not a good morning for Captain Fantastic and his plucky band of brothers. Somewhere on this planet there is a very, very long line of people who all waiting to inform me that I'm a fool ( there's an even longer line of people that want to call me far worse!). That first list gained a few other members today - Oh me of little faith, as the afternoon session saw a collapse of, well, English proportions! Firstly Sehwag fell to the very first ball after lunch from Spin twin Swanny, a HUGE bonus for the England band of brothers. All of a sudden, it's all happening. New man Che Pujara looks like he's batting in pit full of snakes, scorpions and very big spiders, with his first two balls spitting, kicking and generally causing him to have his own version of a squeaky bum time. A couple of overs later our friend Gambhir shows again his application for English citizenship and wish to go straight into our national see by this time running out ( or more accurately, selling out) Pujara. Gambhir prods the ball into the leg side and sets off. New daddy Bell is on it in a blink of an eye, hitting the stumps directly from mid-wicket, with the diving Pujara in no-mans land. Brilliant from Bell. Terrible stuff from Gambhir. Big boom boom bonus for England. Indian wickets continue to tumble on a regular basis throughout the afternoon and after tea with the seamers looking particularly good and happy with the ever increasing variable bounce of the pitch. At one point six wickets fall for 36 runs - bliss! Then, with the Indians on 161-8, I make a mistake of rookie, gargantuan proportions. It was almost as if I hadn't spent most of the last 30-odd years watching some of England's matches………yes, I started counting those proverbial chickens. For instead of the last couple of Indian wickets rolling over in a pitiful example of 'can't be bothered, want to go home' they instead decide against losing the match on the 4th day and actually make England fight for every ounce of the match. At one point we looked certain to wrap up an innings win, thereby saving me having to get up at stupid o'clock yet again tomorrow, only for Ashwin to score an excellent 83 to steer India to 239-9 at the close, a slender lead of 32 runs. Ashwin's brilliant solo performance , which featured an unbroken final wicket 42 with Pragyan Ojha, takes us into a final day. Can England do it?. Of course we can. Probably. And in a flash its all over with the Indian innings lasting just 10 balls until Jimmy Anderson (no relation) bowled last man Pragyan Ojha, leaving Ashwin stranded on 91 and missing out on a much deserved century. This leaves Captain superb and his merry men just 41 to get. It seems that some of the team had other places to be on the day as any thoughts of taking ones time to reach the target were immediately thrown out of the window. At one (worrying) stage England were 8-3 until Bell (finally deciding to turn up for the match) and Nick Compton guiding us home to lead the series 2-1. This win is a serious turn-around by England who were thrashed by by nine wickets in the first Test - remarkable stuff in the context of 3 lost tosses in a row. In all honesty, England have beaten India at their own game. The pitches have been true subcontinental in nature but have still outplayed the Indian team. If England can avoid defeat at Nagpur, they will have won a series in India for the first time since 1985. Roll on Thursday, I can't blooming wait! My personal diaries Test match by Test match. Well what happened to the first two test diaries I hear you ask? ….. and if nobody actually did ask then I'm going to tell you anyway. It is all rather embarrassing if truth be told, as I did something that I always tell my students at college NOT to do. Namely write a fabulous (sic) piece of work and then forget to save it correctly. Yes, two diary entries to be added at once were lost due to my lack of concentration. What a plonker. So, as a measure of recap for what were two incredible Test matches (for completely different reasons), here is a short pre-amble before the 3rd Test match later in the week. 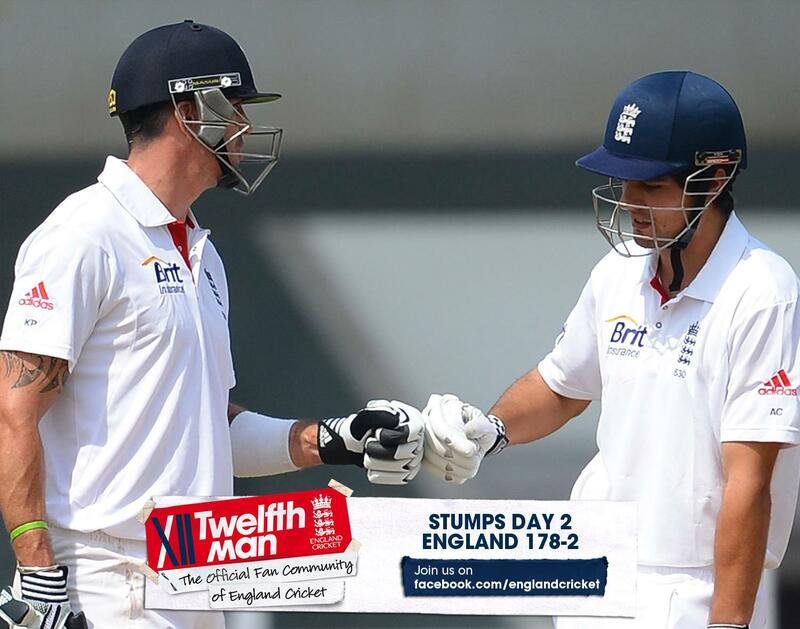 * Captain Cook loses the toss - Oh goody……..
* India have decided against releasing the Kraken (otherwise known as spin). No, they instead decide to be completely unsporting and scored a bucket full of runs on what appeared a flat track of a pitch………..
* Our boys follow on, though this time a show of fighting spirit at last from our batsmen. It should be noted in dispatches the Messrs Cook and Prior portrayed a true Rourke's Drift spirit by defying the Indian bowlers for much of the afternoon and evening sessions………..
* Final day collapse. Bugger………. * India knock off the 77 they need with the annoying swagger of a team that can annoyingly swagger. "Right - listen closely, I've got a cunning plan. We bat & score lots of runs"
"Blimey, I think we can do this lads………er, lads?" * The England selectors suddenly realise that we're playing on the sub-Continent and that including another top line bowler alongside our super spin machine (sit down Mr Patel, I'm not talking about you) might be a bit of a good idea………..
* Things now start to get seriously surreal when our batsmen in reply have a chat and decide that our spinners are actually rather good and that facing spin bowling in the nets is pretty much good preparation of the real thing. Captain Cook and KP share an unbeaten century stand, with the super square-jawed skipper scoring 87 and KP 62 not out to see England finishing the day on 178-2, trailing India by 149 runs. Easy peasy………..
* We lead by 87…………. * Our Spin twins after a chat decide that ripping through the Indian batting order might be a bit of a laugh with Monty getting his second fifer of the match and Swann finally closed India’s 2ND innings by trapping opener Ghambhir lbw for 65, taking his eighth wicket of the match respectively. * It doesn't take England long to finish of India’s tail, India only added ten to their overnight lead collapsing to 142-all out. * Our boys need 57 to win………..
* Our openers have a chat and decide against prodding around for a session and scraping the runs off and instead suggest that it may be a bit of a laugh if the runs were smacked off just 10 overs. Compton can barely control his hysterics with a six. * We win. Easy peasy. * Rather annoyingly finishing off the tail and knocking off the runs was accomplished before I woke up. Another technological disaster with the alarm not going off. Magnificent square jawed Captain Cook checks KP for any hidden mobile phones.